Established in 1983, and providing online casino since 1996, Intertops is one of the oldest, biggest and best. You will also find links to sportsbook and poker on their site, but we are concentrating on casino for now. Blackjack, pontoon, face up 21, super 21, European blackjack, American roulette, European roulette, craps, Caribbean hold ‘em -- and that's just a tiny sample of table games. 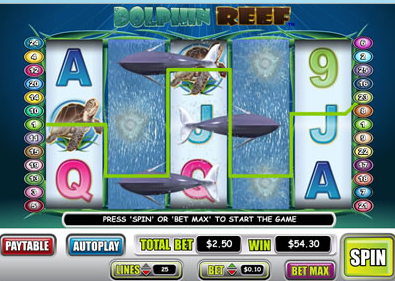 Check out the Real-Series slots including Ronin, Aztec’s Treasure, Diamond Dozen, and Coyote Cash. Also there are three reel slots, five reel slots, video poker and plenty of multi-hand video poker -- in fact about 30 different types of video poker. One quick download or instant play -- you choose. Both options are outstanding. Intertops runs on Real Time Gaming -- slick graphics, realistic sounds, and thrilling gameplay are hallmarks. Simple, straightforward and not flashy at all. If you want to cut straight to the chase, and play over 300 games, this is the site for you. A wide range of common methods are available for depositing withdrawal. Deposit by bank transfer, credit card, and popular web wallets, including Skrill and Click2Pay. View a full table with transaction times and limits under the Cashier page. You're sure to find the method to suit you. As one of the oldest and biggest online gaming sites on the Internet, you can rest assured you are in safe hands at Intertops. Percentage payouts are reviewed by independent auditors, and a monthly eCOGRA payout report is available for your perusal. Intertops is incorporated in Cyprus, and licensed by the Kahnawake Gaming Commission.